• Out of the 2906 submissions, 120 submissions have been withdrawn by authors and 92 have been desk-rejected due to issues such as dual submissions, plagiarism or submissions not conforming to the submission guidelines. (These numbers are likely to still change over the coming weeks as papers undergo review). • The resulting 2694 valid submissions, including 1609 long and 1085 short papers, have been sent to review. • Each paper has been assigned to one of 22 areas for review. Each area is headed by 2-4 Senior Area Chairs (SACs) who are in charge of the overall review process within their area. They are assisted by 3-15 Area Chairs (ACs) who look after a subset of the papers (15 on average). The different areas have 59-319 reviewers, depending on the number of submissions. In total, our Programme Committee includes 2256 people: 46 SACs, 184 ACs and 2026 reviewers (1903 are currently involved in reviewing). • The following table shows, for each area, the number of submissions (long, short and total) that are currently undergoing review. Also Dialogue and Interactive systems are among the top 5 areas in both conferences. However, Document Analysis, which was the 4th largest area last year, ranks only the 16th this year, while Generation (which ranked the 14th last year with 59 submissions) is ranked now the 5th with 156 submissions (the increase in submissions is much larger here than our overall growth rate!). 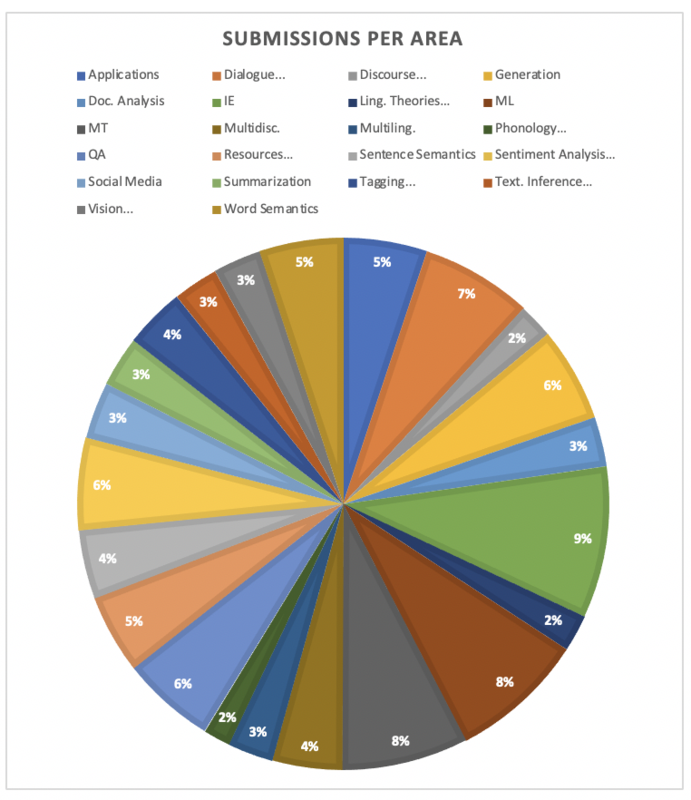 Another surprise is Linguistic Theories, Cognitive Modeling and Psycholinguistics, which clearly grew in popularity: 24 submissions last year, 60 this year. Submissions remain still relatively evenly distributed across the different areas (see the below pie chart) in comparison with e.g. in ACL 2017 where IE was clearly dominating (23.4% of submissions). short papers are clearly more popular than long ones in only one of the areas: Applications. 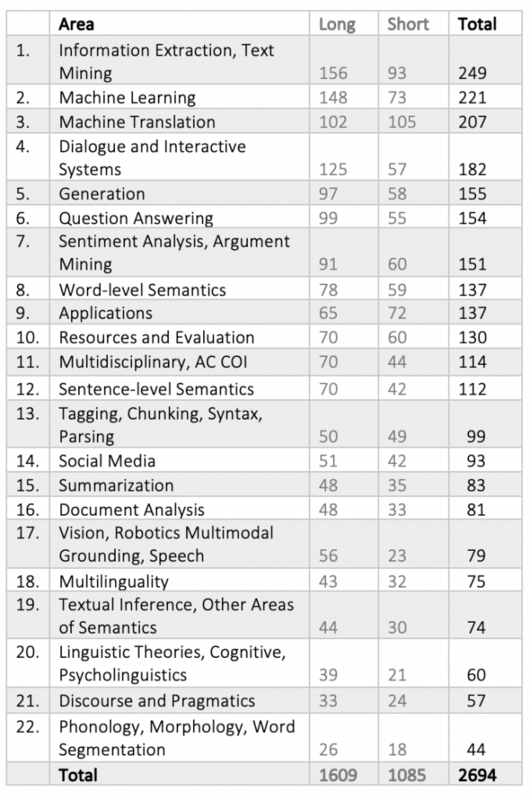 areas that have the clearest preference for long papers (over 65% of submissions are long) include Machine Learning, Vision, Robotics Multimodal Grounding, and Speech, and Dialogue and Interactive Systems. Finally, regarding the geographical distribution of papers, we received papers from 61 countries. 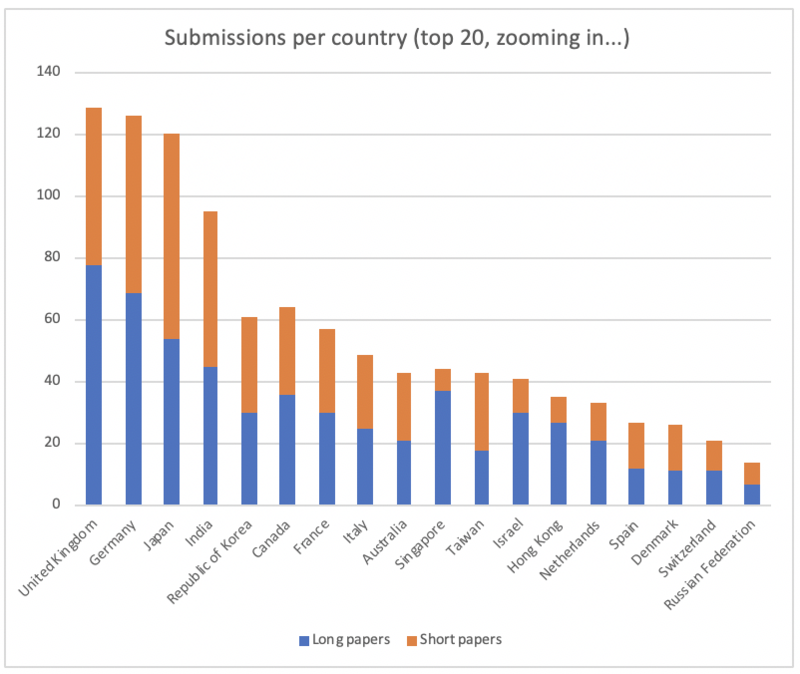 Considering the country of the corresponding author only (which is clearly a simplification), we looked at which countries produced most submissions. The first chart below shows the results for the top 20 countries, and the second zooms into the top 20 countries with fewer than 140 submissions. As expected, we have the US and China in the lead. The UK and Germany rank third and fourth with 129 and 126 submissions, respectively, and are closely followed by Japan (120 submissions). The chart differentiates between the long and short paper submissions. It shows that the top 5 countries, apart from Japan, have a clear preference for long papers. There is some variation among them, e.g. China produces relatively more long paper submissions (69% of all submissions) than the US (60% of all submissions). 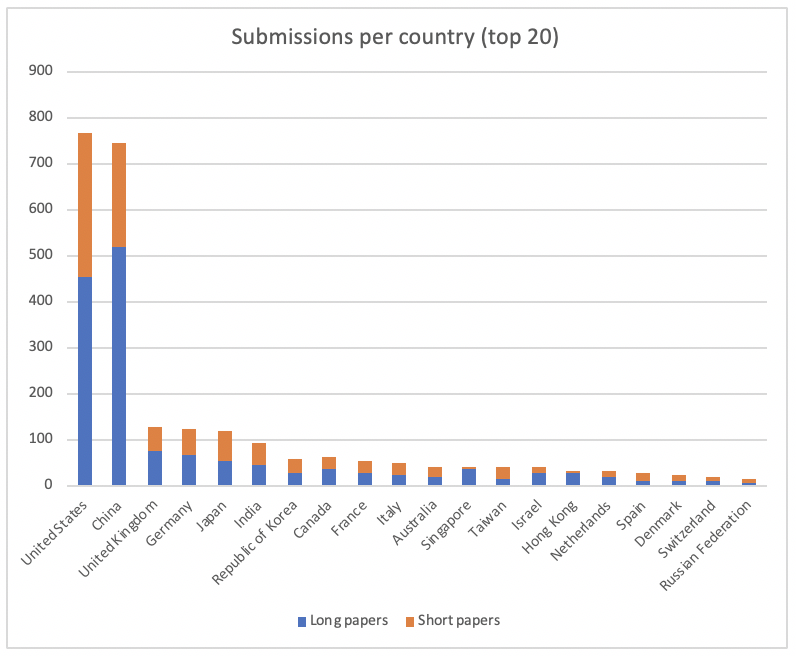 The countries among the top 20 where short paper submissions are more popular than long ones include Japan, India, Taiwan, Denmark and Spain. The countries that have the strongest preference for long papers are Singapore (84% of all submissions are long) and Israel (73%). Let us know if you would like us to compute additional statistics.